It’s sometimes hard to think of new hairstyles for oiled hair. Oiling is such an essential part of our haircare routine that we just can’t afford to miss. It is mostly recommended to oil your hair with coconut oil once every 3-4 days. In reality, a lot of us shy away from oiling our hair because of the restricted options in hairstyles that are left. To take some pressure off those days, and to encourage you to take care of your hair more often, we present some hairstyles for oiled hair that will easily sail you through your ‘oiled hair day’. Here is a simple hairstyle that you can make even while going out with oily hair. Grab some sections from the sides, just above your ears. Clip these strands to the back of your head. Now, braid the length of your hair and tie the end with a small band. This hairstyle goes along most Indian outfits. Experiment with the hair clip to add more color to the style. This hairstyle is one of my favorite hairstyles for oiled hair! It’s been around or many year so no wonder it made it to the films! Divide your hair into 2 equal sections. If you have bangs, you can leave them out of the braid that follows. If not, just take some hair from the front and twist inward until where you will begin the braid. Merge these parts into the braid. We all have our skipped shampoo days. People with oily scalps know the real pain of having to deal with oily hair every second day. This hairstyle is your savior! Just use a claw clip to tie half your hair. Leave the bottom half as it is. If you wish, you can curl the ends of your hair to add more style! Oily hair and a party to attend? Worry not! Take help of someone around and start to make a crown braid. If you are experimental enough, and have the time, you can even try a double crown braid. Keep braiding until the length of your hair. Now, merge the length into the crown braid. Add some colorful accessories or flowers to this Greek goddess hairstyle! This hairstyle is for women with really thick, long hair! If you are blessed with such hair, then most of your hair troubles are over! The oily hair confusion can be dealt with this simple hairstyle. Divide your hair into equal halves along the center. Form an inward braid and keep plaiting until the ends. Finish it by fixing the ends at your neck. This hairstyle can be pulled off when your hair is only a little oily. So make sure there is not too much oil before you begin this. Just leave a little section of hair on both sides of the head. Take the rest and start building up a very loose braid until the middle of your scalp. Tie all the hair in a hair bun to complete the style. Hairstyles for oiled hair work with thin hair as well. My lovely ladies with thin hair, who think oiling will take away the little volume that you have, this one is for you! Make a simple Indian braid and keep it a bit loose at the top. Plait your entire hair up until the last strands. Now bunch up the ends with a hair band. Put the end of the braid from beneath your hair and fix it in the middle. So easy! Wondering how to use a butterfly clip on very long, lustrous, oily, thick black Indian hair? The hairstyle below shows you how to. Tie your hair into a low loose bun. Leave enough hair to form an 8 shape along the length of your head. Secure these strands using a claw clip. Ta-dah! Thick, long, oily hair sorted! Oily hair but need a hairstyle for a family function? This updo will save your day. You will need extra accessories to pull this one off. Shop for some hair pads, jooda nets and some colorful accessories. Puff up the hair on the top of your head. Secure it using lots of bobby pins. Now divide the hair into 5 sections. Insert a hair pad under each section to give it volume. Secure the jooda using a hair net! Who would have thought of braiding your hair upwards! Start the braid until you reach the top of your mane. Make a messy bun of the hair that is left. If you have highlighted hair, this hairstyle just brings out the highlights like no other! Add a flower or any big accessory to accentuate the style. 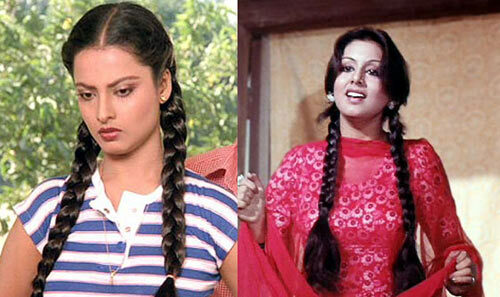 Here is a quick hairstyle which is already a popular hairstyle of most Indian women with long hair. It would go equally well with non-oily hair too, but will be your friend on an oiled hair day also. Make sure you comb your hair well so it’s neat, which is necessary as a base for this hairstyle. Use your hands to form a loose bun and secure with some pins. All children born in the last century would have memories of the girls in school with these type of hairstyles for oiled hair. A school hairstyle then, it still can be worn to various events. Separate your hair into equal halves and braid them. Just at the ends, start braiding a colored ribbon along with the braid. Now form a U shape with your braid and tie the remaining ribbon into a bow around the braid. Want to sport that care free look? For all the busy bees, this hairstyle will need just 1 minute out of your busy lives. The oil in there will make sure that no loose ends are left wandering around. Make a loose bun which falls to your shoulders. Make sure to secure the hair, as oil may make the jooda slippery. This one again is for the very long haired women. Braids are a bright light in this struggle with long hair. There is a huge variety in the type of braids and they all give different looks. Make a head band while braiding your hair and continue to braid through. The shine in the oil will add more glamour to this look! Oiled hair but in need of a gown hairstyle? Worry not! This hairstyle is perfect for the special evenings! Very classy and graceful, this style will complement just about any formal evening wear. Form a loose braid and tie it up just about a feet from the end. Now tie the remaining hair into a tight braid. Make a high bun and secure using bobby pins. Long hair are a blessing when it comes to making buns. I can name many women who miss sporting a bun, just because their hair is either too short or too light. So if you are blessed with long hair, just tie when into a twisted bun. The longer the hair, the more volume it puts into the bun! This hairstyle is very similar to the one we just described above. When you make the bun, just make sure you leave a big section in the center, more in a protruding fashion. You can also add some accessories to match the outfit you will be wearing! Isn’t this hairstyle just lovely! Simple, chic, elegant, girly and sleek. Leave a side section while you make a low center bun. Now wrap the side section around the bun keeping the hair a little loose, just so much to cover your ears. Leave some strands to fall on the sides of your face to complete the look! The biggest problem we have to deal with oiled hair is that the hair tends to ‘sit’ on your head. It’s like something is pressing it against your scalp especially after using coconut oil. The problem can be solved with a puff! Back comb your hair to give it more volume. Use a small claw clip to put the hair together. Give some waves to the remaining hair to complete the style. Twist and turn and fix! Here is an extremely simple one which you can manage with a claw clip. Comb your oiled hair backwards so your hair look neat. Now grab all the hair together and keep turning them to form a tight swirl. Now use your fingers to form a bun. Clamp a claw clip on it and you are good to go! You need to have just the right amount of oil on to finish this well. A good haircut will also supplement the overall look. Side swipe your hair and pin it up just above your hair. Pin up the little hair on the other side. Now braid the hair into a loose dangling style. You can even pull out some hair from the braid to increase its area! Hair clips can do wonders with hairstyles for oiled hair. Hello straight hair! Oil helps in taming frizzy hair like no other serum does! It also reduces the volume of your hair a bit. So a good hairstyle should bank upon the taming and eliminate the reduced volume. This style does just that! Just curl the ends and use a jaw clip to put together the hair on the upper half of your head. The braid it probably the most classic example of hairstyles for oiled hair. Classes to attend or a Pooja to go to? Shopping to be done or parlor appointment, this style can just be worn anywhere. It’s an inward braid. The longer the braid, the better the look. You can also add some nice accessories to accentuate the look. Pretty similar to the last style, this braid will begin at the middle of your scalp rather than at the neck. It adds more volume and height to your style. This style goes well for medium to long length hair. Stylish and very page 3 like! A very modern air hostess type of hairstyle it is definitely going to make some heads turn! This style suits almost all face shapes, but the best look comes on a long face. Make a high pony tail after combing your hair properly. Then make a donut at the top of your head. Nothing else is needed as this style is an icon in itself! A hairstyle for festive season and wedding functions! Leave some side bangs on one side. Tie the half of the hair using a pin or a rubber band. Now grab a small section of hair from both sides, twist and twist and fix in center. Do the same again for a next small section. Make 2 to 3 sections at the most. Braid the length of the hair in a light braid and voila! Probably one of chicest hairstyles for oiled hair out there currently. This last style on our list is for women blessed with really long hair. You will really need so many turns to put all of that long hair into a bun! Just keep turning the hair into a bun until all the hair is fixed in. Do make sure that each turn is easily identifiable from the other. I hope you will agree that there are loads of options to try for hairstyles for oiled hair. Take you pick from any of the classic oiled braids to silky hair buns and look amazing. Remember that oily hair does not have to equal boring. Go wild and try any of the hairstyles above. You know you are worth it!